Get behind the wheel with the latest driving title from the makers of the Burnout series. Dangerous Driving is a 3rd person arcade driver which might have you singing the Daytona arcade song when you get it for your PlayStation 4 on Tuesday or XBox One on Wednesday. Another previously exclusive Nintendo title is making the jump to XBox One and Steam with Phoenix Wright: Ace Attorney Trilogy out on Wednesday. No longer will you have to restrict yourself to your old Gameboy DS for your Courtroom based JRPG fix with the trilogy including 14 episodes to play in the collected trilogy previously released for the Switch. Experience true RELAXATION as the makers of Job Simulator bring you their next GAME with Vacation Simulator out on every VR platform through Steam. Job Simulator is one of our all-time favourite VR titles with it being one of the best to introduce your friends to VR and cause havoc. Planned for PSVR later this year you can play it on your Steam supported VR headset this Wednesday. 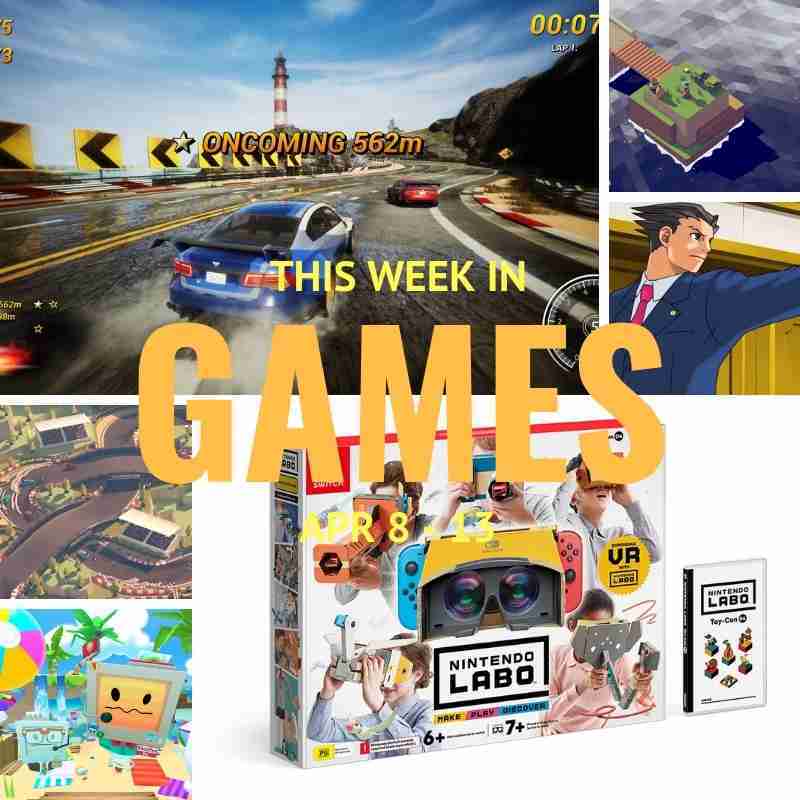 Also in VR this week is the latest Nintendo LABO Cardboard Kit for your Nintendo Switch – LABO VR! We covered this a few weeks ago when it was announced and since then Super Mario Odyssey and Breath of the Wild have been announced as adding VR support before the end of April. If you have a Switch all the kits will be out on Friday. And lastly if you have an urge for something more like the SNES edition of Legend of Zelda then we want to suggest you check out Leaf out on Steam this Friday. This cute little isometric title has you battling monsters, finding loot and bringing balance to parallel worlds and looking pretty good too. Honourable Mention: And our honourable mention this week goes to a tiny racing game out on Steam on Saturday. Hotlap Heroes is a single view 8 player racing game that lets you play against your friends locally or via online multiplayer. But what makes this REALLY cool is you can play it using a Smartphone app as a controller so you aren’t all fighting over the same keyboard or needing to buy multiple USB controllers.